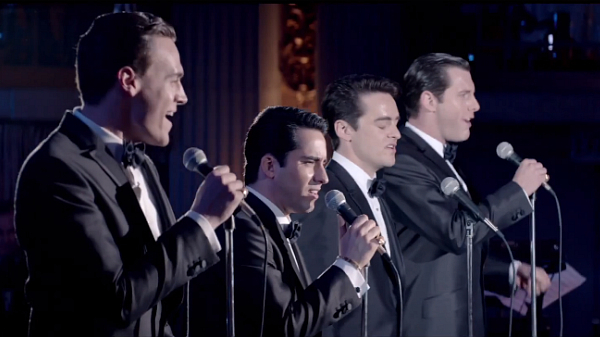 Jersey Boys is the latest musical theatre blockbuster to get the big screen treatment. Viv Wilby assesses Clint Eastwood’s take on this tale of crime and close-harmony singing. She’s never, to the best of my knowledge, expressed any particular interest in or fondness for the music or personalities of the Four Seasons, but there’s something about the way the show tempers nostalgia for the bubblegum pop of the early 1960s with a bit of grit and edginess (plenty of effing and jeffing, as my mother would say) that has struck a chord with the baby boomers and made it a Theatreland fixture. In its sixth year in the West End and ninth on Broadway, it now hits the big screen, directed by no less an icon than Clint Eastwood – a bigger star than any of the Seasons and an early 60s heartthrob to the teenage likes of my mum. There are ironies galore! More of these later. Jersey Boys is certainly a smart show, with a spareness and intelligence that elevates it above most other jukebox musicals (long-time Woody Allen collaborator Marshall Brickman worked on the book). It charts the rise of the Four Seasons from the Mafia-tainted streets of New Jersey to the top of the hit parade and the internal tensions that led to the implosion of the original line up. Like Bucks Fizz, they staggered on with various changes of personnel. The show is structured over four acts or ‘seasons’ – spring, summer, autumn and winter – each narrated by one member of the quartet: talented pint-sized frontman Frankie Valli; clean-cut songwriting genius Bob Gaudio; self-destructive gambler and hustler Tommy DeVito; and boring bassist Nick Massi. As such, it offers an intriguing multiplicity of perspective on the nature of ambition, talent, fame, success and failure. As the Four Seasons’ poppy back catalogue lacks the necessary light and shade to stand in for a proper musical theatre score, the songs play second fiddle to the drama, underscoring and punctuating the story, but rarely amplifying it. Numbers tend not to be performed in full, with one member of the group often breaking off mid-chorus to address the audience directly. And as this is a musical about the music industry, the songs are firmly diegetic, making it a musical even musical-phobes can tolerate – perhaps another reason for its spectacular success. Jersey Boys makes the jump to film largely intact, but the result is a curiously flat affair. Without the pep and fizz of live performance, the musical numbers need something to lift them, but Eastwood plays it very straight. Some songs, such as the plangent My Eyes Adored You, which reflects Frankie Valli’s strained family life (a rare moment when story and song are in perfect accord) are relegated to background music, cued onto the soundtrack at the appropriate moment. The songs feel small, muted and contained when they should be allowed to soar. Even Can’t Take My Eyes Off You, Valli and Gaudio’s big comeback number, which anchors the second half, never takes off. It’s only as the final credits roll and December, 1963 strikes up that Eastwood allows his cast to let rip and gives the music room to breathe. So this is more musical biopic than musical (think Walk the Line rather than Singin’ in the Rain), and that is a worthy and predictable choice for Eastwood, the sombre chronicler of American history. But the broad character brushstrokes and chronological elisions that are permissible on stage, are found wanting on screen. The problem is not helped by the cast. Vincent Piazza (as Tommy) is the only one of the principals who has significant screen acting experience (playing Lucky Luciano in HBO’s Boardwalk Empire) and, tellingly, the only one who manages to find more than one dimension to his performance. The others – all veterans of either the original or touring productions, including John Lloyd Young reprising his Tony-award-winning turn as Frankie – are fine, but unmemorable. Other problems include an incredibly flabby first act, a succession of well-worn cliches of blue-collar Italian-American life: shouting matches over spaghetti and meatballs; mouthy girlfriends; skirmishes with the law; whispery mobsters. But it’s all so clean and bland that, despite the Mafia presence, there’s no tension or menace, or really any suggestion that this is a world that needs to be escpaed from. The tight focus on the Four Seasons themselves is also problematic as it means any sense of context is lost. You wouldn’t know that it’s the 1960s, except you know that it’s the 1960s and there’s no sense of what the Four Seasons’ music meant to the wider world beyond the bellowed endorsements of a couple of disc jockeys. Who were the group’s influences? Who were their rivals? What did they make of the British invasion? Civil rights? Vietnam? Such matters are never touched on. For those that care, there are some nice little ironies (I said I’d get to them) and in-jokes. Christopher Walken turns in a sleepy performance as Gyp DeCarlo, the group’s benign and sentimental mobster patron, playing on his reputation as furtive song-and-dance man and, more specifically, that bar scene from The Deer Hunter where he grooves along to Can’t Take My Eyes Off You. Joe Pesci appears (not the actual Joe Pesci, but a teenage version of him) as the person who brokers the meeting between Bob Gaudio and the rest of the gang. Pesci was apparently from the same neighbourhood, his character in Goodfellas was named Tommy DeVito, of course. A scene from Billy Wilder’s Ace in the Hole inspires Gaudio to write Big Girls Don’t Cry. Most egregiously is Clint himself, inserting his younger self into the action via a brief Rawhide clip. Jersey Boys is stodgy and unimaginative entertainment but will probably do solid enough business given the stage show’s success. Take your mothers.